Do a google search on corkscrew rule images. They are ubiquitous. So much so that the simplest demonstration of the translation-rotation principle is Michael Faraday’s homopolar motor of 1821. It featured a battery, a wire and a bath of mercury, but what do we see at the top of the Wikipedia homopolar motor article? A contemporary homopolar motor featuring a battery, a wire, a magnet, and a screw. But pictures of the electromagnetic field are as rare as hen’s teeth. There’s a gap between the talk and the walk. You can read on Wikipedia that “over time, it was realized that the electric and magnetic fields are better thought of as two parts of a greater whole – the electromagnetic field”. You can also read what Oleg Jefimenko said: “neither Maxwell’s equations nor their solutions indicate an existence of causal links between electric and magnetic fields. Therefore, we must conclude that an electromagnetic field is a dual entity”. In addition you can read where John Jackson said “one should properly speak of the electromagnetic field Fμv rather than E or B separately”. But that’s in section 11. Not section 1. And people do speak of E and B separately, all the time. There’s an awful lot of places where you can read about the electric field and the magnetic field as if they’re two separate entities. And there’s virtually no places where you can see the electromagnetic field as the single entity it’s supposed to be. Sometimes it feels like Maxwell’s unification never happened. Sometimes it feels like Hermann Minkowski’s Space and Time never happened either. Towards the end, near figure 3, Minkowski said this: “In the description of the field caused by the electron itself, then it will appear that the division of the field into electric and magnetic forces is a relative one with respect to the time-axis assumed; the two forces considered together can most vividly be described by a certain analogy to the force-screw in mechanics; the analogy is, however, imperfect”. He was talking about the electron’s field. That’s an electromagnetic field. And he referred to electric and magnetic force. For charged particles, electric force is linear, whilst magnetic force is rotational. They’re related by a screw analogy, because of the screw nature of electromagnetism: a motion of translation along an axis cannot produce a rotation about that axis unless it meets with some special mechanism, like that of a screw. Because in ∇ × E = −∂B/∂t the equals sign is an “is”. The curl of E is the time-rate of change of B. But we don’t read about this. What we read instead that you create a magnetic field when you move a charged particle such as an electron. It just isn’t true. You know this, because you know that motion is relative. We could leave the electron exactly where it is and move you relative to it. However your motion doesn’t create a magnetic field for the electron. Because all along the electron had an electromagnetic field. Not an electric field, not a magnetic field, an electromagnetic field. You merely see a different aspect of that field when you move, that’s all. Because that field has a screw nature, and because it takes two to tango. Because each has an electromagnetic field. Yes, an electric field can be visualized on paper by drawing radial lines of force, or radial field lines if you prefer. But this visualization is not a good one for a charged particle. That’s because the force is not the same as the field. It results from electromagnetic field interactions, and it takes two to tango. An electron is not surrounded by a field of force. Nor is a positron. We only see a force when we set down a second electron, or a second positron. If we then have two positrons with no initial relative motion, they move apart linearly. We might then think that we could draw outward pointing arrowheads around each positron to represent the force pushing them apart. But if we have two electrons with no initial relative motion, they also move apart linearly too. For consistency we’d have to draw them with outward pointing arrowheads too. So the arrowheads just don’t work. Moreover they come with the mental baggage of sources and sinks. There is no outflowing from a positron. There is no inflowing for an electron, just as there is no inflowing Chicken Little waterfall of space for a gravitational field. All in all, electric field lines just don’t work for charged particles. Only it isn’t enough. Because when you throw an electron through a solenoid, its path will trace out a clockwise helix. And when you throw a positron through a solenoid, its path will trace out an anticlockwise helix. That’s because the rotational magnetic force on a charged particle is orthogonal to the particle motion and to the magnetic field, as per the right hand rule. It also depends upon the charge. But when you throw a magnet through a solenoid, there is no helical path. Electrons and positrons move in opposite spirals in a bubble chamber, because of the magnetic field within it. But a magnet doesn’t spiral in a magnetic field. Magnetic field lines on their own are not enough. The motion of the electron or positron in a magnetic field is a product of the particle itself and the field. It takes two to tango. And it isn’t because the electron or positron has a magnetic field. The little magnet moves directly towards the big magnet, it doesn’t move around the magnetic field lines. The electron does, not because it has an electric field with field lines pointing inwards, not because it has a magnetic field with field lines going around and around, but because it has an electromagnetic field. It’s a combination of the electric field and the magnetic field, and you need to see it to understand it. 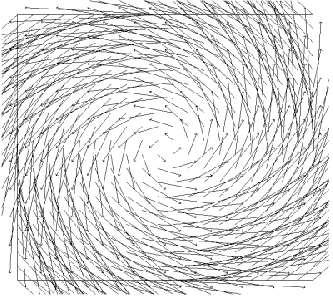 Then you see the rotation, and the whirl, the twirl, and the screw structure. You see the screw structure of the “spinor”. The thing that’s responsible for the screw nature of electromagnetism. The thing that’s responsible for the way that charged particles move. When you set down an electron and a positron such that they have no initial relative motion, they move directly towards one another. The force is linear, and we talk of Coulomb’s Law. That says the electrostatic force between two charged particles separated by a distance r is F = ke(q1q2) / r². The ke is Coulomb’s constant which is 1/4πε0, the 4π being related to a sphere and the ε0 being vacuum permittivity. The force is attractive if the charges q1 and q2 have opposite signs, and repulsive if they don’t. But why? These two charged particles aren’t throwing photons at one another. Or boomerangs. The virtual photons that are described as exchange particles are virtual. They aren’t real photons. They only exist in the mathematics of the model. Hydrogen atoms don’t twinkle, and nor does positronium, which is often described being like light hydrogen. There is no vortex sea. We don’t talk of spinors for nothing. A bispinor isn’t used to describe relativistic spin ½ wave functions for nothing. Because the vortices are the particles. On such the world turns. So, why do the particles move linearly and rotationally? We refer to the Lorentz force law for this. The linear and/or rotational force on a particle of charge q is F = qE + qv Χ B, the v being velocity, and E and B being electric and magnetic fields respectively. Is this force present because charged particles are throwing photons at one another? No. Those photons are virtual, and virtual photons are not real. Is it because of some magical mysterious action at a distance? No. Even Newton knew that, over three hundred years ago. See his 1692 letter to Richard Bentley where he said this: “That gravity should be innate, inherent, and essential to matter, so that one body may act upon another at a distance, through a vacuum, without the mediation of anything else, by and through which their action and force may be conveyed from one to another, is to me so great an absurdity, that I believe no man who has in philosophical matters a competent faculty of thinking can ever fall into it”. He was talking about gravity as opposed to electromagnetism, but the same principle applies. I suspect Descartes knew that nearly four hundred years ago. I also suspect that if you’ve read Lorentz’s Nobel lecture you may have noticed that “this force is always due to the ether in the immediate vicinity of the electron”. Replace ether with space, and look to fluid dynamics which says counter-rotating vortices attract. Kelvin talked about this. If you know that, you will also know that co-rotating vortices repel. And that vortices swirl around one another too. Then you will know that the reason charged particles move the way they do is because of their spinor nature. Why? Not because they’re slinging photons back and force. Not because of some magical mysterious action-at-distance. But because each is a dynamical spinor in frame-dragged space. A cyclone has intrinsic spin. So does an anti-cyclone. That’s what makes it what it is. Cancel one spin with the opposite spin, and all you’ve got is wind. An electron has intrinsic spin too. So does an anti-electron. That’s what makes it what it is. Cancel one spin with the opposite spin, and all you’ve got is light. It all makes sense. The state of space where a gravitational field is, is inhomogeneous. The state of space where a photon is, is curved. It’s curved one way, then the other. The state of space where an electron is, is curved, all the same way, all the way round. The state of space where a positron is, is curved, all the same way, all the way round, but the other way round. Only it isn’t just curved in two dimensions, it’s curved in three dimensions. It’s curled, it’s twisted. In a way the electron is a twistor, and its electromagnetic field is twistor space. It’s not like Penrose suggested, but it’s not far off. You could say the electron electromagnetic field is a twist field. Look at the picture above. Hold your arms out wide and imagine you’re an aeroplane. Imagine you could fly forward into this twisted space. Imagine what would happen: your wings would tilt, they would turn clockwise with the twist. The twist results in a turn. Only if you weren’t moving, if the electron was moving relative to you, you might think you were in a turn field, not a twist field. That’s what the screw nature of electromagnetism is all about. Twist and turn. That’s why the electromagnetic field is a dual entity and the greater whole. Because it’s a twist field, and when you move through it, you turn. That’s why a charged particle has an electromagnetic field rather than an electric field or a magnetic field. Because it’s an electromagnetic wave going around and around, and there’s only one wave there. You cannot remove the electric aspect of the electromagnetic wave, because it’s merely the spatial derivative of potential. Nor can you remove the magnetic aspect of the electromagnetic wave, because it’s merely the time derivative of potential. Nor can you do either when the wave is going round and round in the guise of a spin ½ standing wave. In this respect the phrase electric charge is a misnomer. The charged particle has an electromagnetic field, so we ought to call it electromagnetic charge. Yes, we can contrive an ensemble of charged particles so that some aspect of their electromagnetic fields are counter-balanced and so masked. Then when we observe other charged particles, we sometimes see the linear force only, and we sometimes only the rotational force only. When we only see the linear force we talk of an electric field, when we only see the rotational force we talk of a magnetic field. To understand how this works, we have to understand how a magnet works. For some strange reason Feynman couldn’t explain it. Richard Feynman, the great explainer, couldn’t explain how a magnet works. He didn’t understand it. But amazingly, in 1820, André-Marie Ampère did. PS: I’ve been deluged with robotized medical spam so I’ll have to tighten up on the comments. Apologies for any inconvenience. Please try to avoid pharmaceutical-like words.